LGL offers you the ability to create templates for labels that can be used to address physical mailings. Define your label file in Microsoft Word. In this case, labels produced will be contained in a Word document, and you have control over the formatting to the extent that Word offers. You can also make changes to the address as necessary after the files have been generated. Define your labels directly within LGL. In this case, the labels will be in PDF format and will not be editable. We generally recommend using Microsoft Word because it is more flexible and reliable when it comes to formatting and printing. All accounts in LGL come with three default label templates: Avery 5160, Avery 8162, and and Avery L7161. It is also possible to upload your own template into your account, but please read the note below first. Note: Before uploading a new label template into your account, search for "Avery template compatibility" with your desired label template to make sure it is not already compatible with the default templates. For example, Avery template 5630 is the same as Avery template 5160, which is included in your account as a default. Use the LGL merge tag [[address_block]] where you want the address to appear in each label. Note: The [[address_block]] merge field is the only merge field that works to create labels. Set any spacing and font preferences, so the labels are positioned how you want them. Save the Word document on your computer with a name you'll remember. Once you have the file ready, you can click the Add label template button, name your template, and then choose the option to create your label in Word. From there, you can browse for the file you just created on your computer and then save the template. Then you'll have a new kind of label ready to use in any mailing. It's possible to create label templates directly in LGL, which is a bit easier, but the options for formatting are fairly limited. 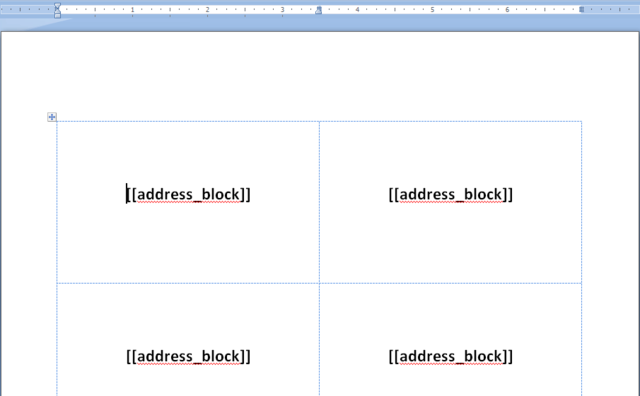 In Word, you can set how many labels you want on a page, but you have to use the address_block field. Whereas if you create templates in the LGL Editor it is not possible to then change the number of labels on a page--you have to use one of the two pre-set label types LGL offers. But you can alter what will go into the address_block field. You also have the option to choose from among a number of different fonts and can select the font size. These labels will be generated as PDF files. From here, you can choose the label type (Avery 5160 or Avery 5162), font, and font size, customize the merge fields included in your Address Block, and then save the template.